He goes back into business and is immediately confronted by two local thugs who want a piece of the action - either he cooks for them, or he doesn't cook at all. Searching for a way around them, he meets Carl and Zeke Higgins, members of a local family distributing meth for the Sinaloa cartel. Before he knows it, he's so far in he can't get out. The only way to go is up - all the way to the top to cartel leader Joaquín Guzmán himself. Along the way, he has to deal with the local thugs and a Kentucky family hell-bent on holding his bosses hostage. And in the end, what Guzmán asks of him might be too much. I couldn't stop listening to this story. So some other things went undone. It was worth it though. The grass IS a little high, though. Where does Startup rank among all the audiobooks you’ve listened to so far? Startup is one of the best I've listened to. Sam and his family, and the Johnson family. The confrontations, the dead-on Southern voices. The scenes between Lyle and the Johnsons. Someone said, “A good story consists of just one damn thing after another.” Gil Miller seems to have taken that to heart. I don’t know that you can call an audiobook a “page turner,” but I had a hard time forcing myself to stop occasionally to attend to the necessities of daily living. While there is plenty of action in this Southern crime drama, there’s a lot more to it than your standard shoot-em-up. At that, the action is almost all original and unexpected, and is vivid enough to satisfy the most demanding fan. That said, "character" is central, the narrative laced with moments of emotional depth, insight, and humor—the thinking person’s Southern crime drama. I laughed out loud several times, more often, I think, because of the perfect pitch Tommy G. Kendrick hit, his voice a dead-on match with the dark, tongue-in-cheek humor sprinkled throughout. Kendrick’s narrative voice makes each character so vividly clear, I felt like I knew them. 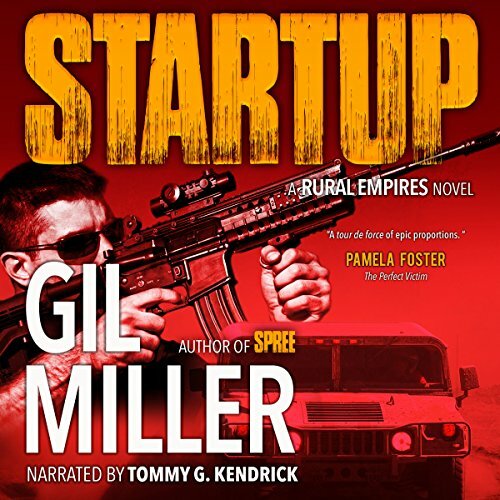 The perfect marriage of story and narration comes together in this audio of the novel, "Startup." This would make a great movie.